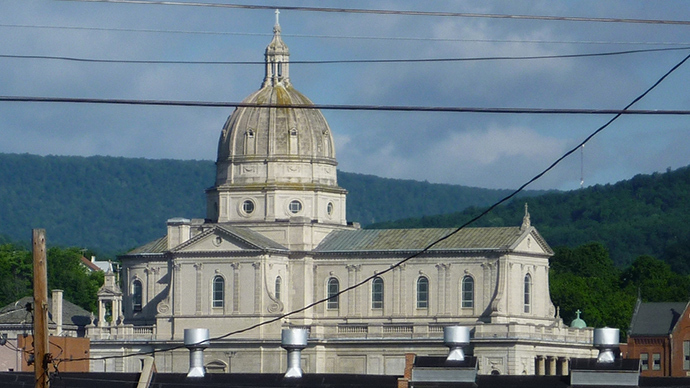 A religious service in Altoona, Pennsylvania was interrupted over the Easter weekend when a parishioner’s handgun accidentally discharged during a Catholic mass. The incident unfolded during Saturday’s 11pm vigil at the Cathedral of the Blessed Sacrament in central PA when a firearm belonging to one of the churchgoers went off shortly before the end of mass. "I didn't really know what that was. I thought it was coming from outside,” added churchgoer Asher Carr. The man, who had not been identified as of Monday, was “beyond lucky,” Officer Heck told the newspaper, that he didn’t sustain any serious injuries. Next, however, he’ll have to hope that his lucky streak continues as authorities examine whether or not they’ll press charges. Sgt. Marshall Worling told the Associated Press that both the local police department and the Blair County district attorney's office are investigating the incident in order to determine whether charges, if any, should be filed against the man. According to the AP, the gun owner had a permit for the weapon and was legally allowed to carry it when it discharged. Nevertheless, Bishop Mark Bartchak of the Altoona-Johnstown diocese told the newswire that "guns have no place in our cathedral or any of the other parishes in our diocese" because churches "must be an environment in which all feel safe." "I'm all for the rights to carry gun everywhere and anywhere, but I'm just thankful no one was hurt. He hurt himself, I guess the bullet grazed him, but you have to consider that [at] Easter vigils there's lots of families there with younger kids and anything could have happened," Blessed Sacrament parishioner Sue Talesky told WATM this week.